Selaginella lepidophylla in a large plastic pretzel jar. Since I took this photo, I placed some small stones in the bottom, turning it into a sort of enclosed pebble tray. 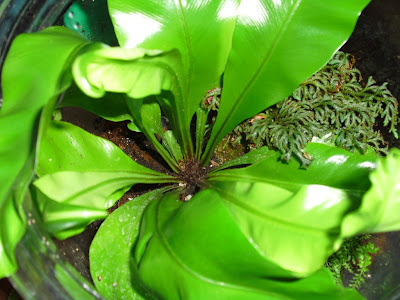 My Asplenium nidus sticking up out of its jar. This is a closed, though not airtight, terrarium. The lid had been removed for the pictures. Looking down into the center of the plant. This show also shows one of the NoId Selaginellas that also grow in this terrarium. View of whole jar, showing the second Selaginella. 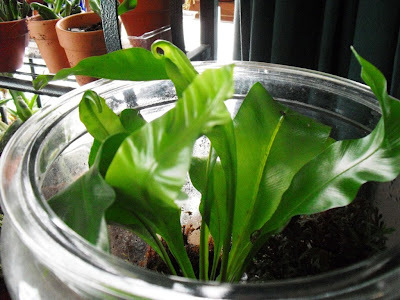 I'm actually reluctant to take the Asplenium out of the jar, because years ago, I had another Asplenium that grew splendidly in a small terrarium. Once it outgrew its space, I tried transplanting it to a larger container, and it never recovered. So far, this one hasn't been harmed by bumping up against the lid. Last year my collector's impulse took over, and I started looking around for different jars, and sources of plants. That is why I now have five other terrariums, although the plants in two of them are struggling. Here is a picture of three of those that are doing well. 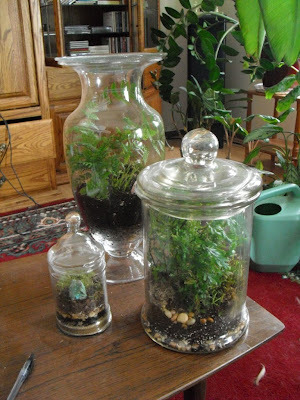 Three terrariums, with a mix of Selaginella, ferns and mosses. I used a glass plate as lid for the tall vase in the back. I love the look of Terrariums, and they allow me to grow humidity-loving plants I wouldn't bother with in the open air. Mine aren't as manicured or artistic as some, but I'm still pretty pleased with them. I haven't had a terrarium in years, but you're inspiring me to give it a go. 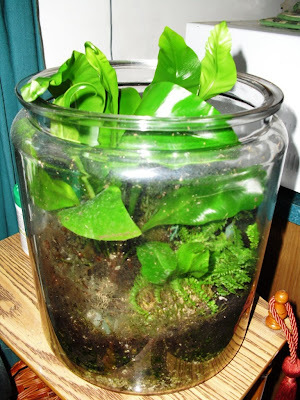 I'm jealous - I want a terrarium (maybe then I could keep some ferns alive) but I'm so broke right now it's not funny.